천마총에서 발견된 신라 때 금관이다. 천마총은 경주 고분 제155호 무덤으로 불리던 것을 1973년 발굴을 통해 금관, 팔찌 등 많은 유물과 함께 천마도가 발견되어 천마총이라 부르게 되었다. 이 금관은 천마총에서 출토된 높이 32.5㎝의 전형적인 신라 금관으로 묻힌 사람이 쓴 채로 발견되었다. 머리 위에 두르는 넓은 띠 앞면 위에는 山자형 모양이 3줄, 뒷면에는 사슴뿔 모양이 2줄로 있는 형태이다. 山자형은 4단을 이루며 끝은 모두 꽃봉오리 모양으로 되어있다. 금관 전체에는 원형 금판과 굽은 옥을 달아 장식하였고, 금실을 꼬아 늘어뜨리고 금판 장식을 촘촘히 연결하기도 하였다. 밑으로는 나뭇잎 모양의 늘어진 드리개(수식) 2가닥이 달려있다. 금관 안에 쓰는 내관이나 관을 쓰는데 필요한 물건들이 모두 널(관) 밖에서 다른 껴묻거리(부장품)들과 함께 발견되었다. Cheonmachong Tomb was at first called the Ancient Tomb, No. 155, in Gyeongju District. After excavating the tomb in 1973, researchers concluded that this tomb belonged to Sojimaripgan or Jijeungmaripgan, the 21st and the 22nd king of the Silla Dynasty. Many relics were unearthed from this tomb, such as a gold crown and bracelets. Inside the tomb, there is a drawing of a flying horse, which is why the tomb became known as Cheonmachong Tomb, which literally means the “mural of a flying horse”. 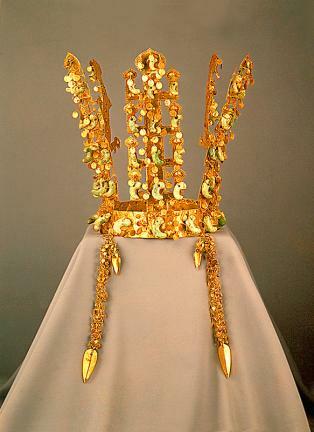 This is a typical Silla crown. 32.5cm in height, this particular crown was worn by Sojimaripgan when discovered by researchers. Some of the features of the crown include: 1. 3 lines forming the Chinese character ‘mountain’ (山) on the front, 2 lines of the shape of a deer horn on the back, and, over the top, a wide band fixed on the head. 2. The Chinese letter is in the shape of quadplex with flower blossoms on the end. 3. There is much harmony between the bent jade and golden circle deck. 4. Another decorative element is the golden deck and the golden thread. The two dangling fixings in the form of a leaf is attached to the end of the crown. But when the crown was excavated, they were separated from the wide belt of the crown. Due to other remains that were discovered outside the coffin, this crown has been in controversy, particularly in regards to how it was worn and the proper etiquette regarding when it was worn at the time.